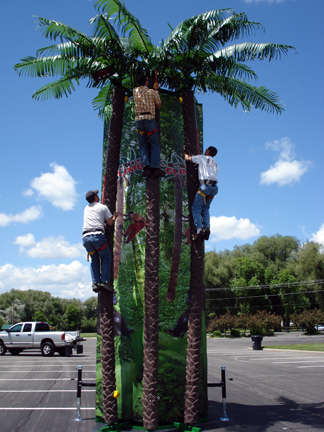 Rent a Coconut Tree Climber Mobile Wall - Portable Coconut Tree Rentals - 3 Climber - Our 25', 3 Climber Tree all is great for both kids and adults. Talk of the Town, Gaithersburg, MD. Coconut Tree Climber- Hard - 3 Climber - Our 25', Tree Climber is great for both kids and adults. It is invigorating, challenging, and most importantly, safe because of its auto-belay system. This activity is a great substitute or addition to any rock wall. Includes: 3 Trees, harnesses, auto-belays, and 2 attendants. Space: 31'l x 10'w x 25'h and 28' x 8' trailer must be driven into place. Great for ages 6 and up.